Nothing adds flavor to a road trip like a historic old road. The road you choose to ride is probably the single most important element in enjoying your Royal Enfield motorcycle. For me, that means finding a route with few stop lights and without stretches demanding high sustained speeds. If the road offers great scenery and historical interest, even better! 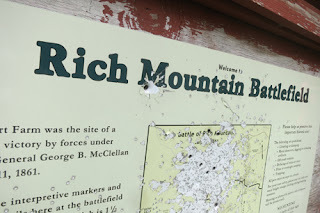 And so, on a recent trip to West Virginia, my wife Bonnie and I were delighted to discover the road to Rich Mountain. Tiny brown sign in Beverly points up County 37/8 toward battlefield. From historic Beverly the road wiggles up the mountain. The reason for all the switchbacks is simple: it was designed to have no more than a 4 percent grade, so horse and oxen-drawn wagons could climb it. 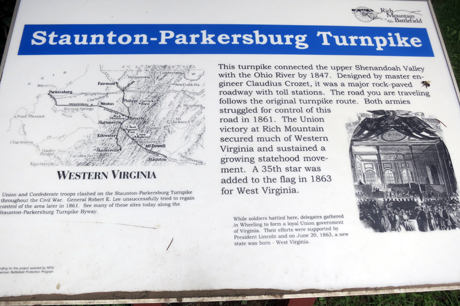 Back then, this winding little road was the vital Staunton and Parkersburg Turnpike and, in 1861, it was worth fighting for. It was the connection between the fertile Shenandoah Valley and the Ohio River — and both the Union and the Confederacy wanted to control it. Into the deep woods atop Rich Mountain in West Virginia. In one of the first battles of the Civil War a Union Army under Gen. George B. McClellan climbed Rich Mountain, to attack Confederate fortifications blocking the road. McClellan — over caution would dog him his entire career — feared making a frontal attack straight up the road. But the heavy woods to each side appeared to offer no alternative. His subordinate, Gen. William Rosecrans, learned that the family farm of a young Union sympathizer in camp had been seized by the Confederates to guard the rear of their position. 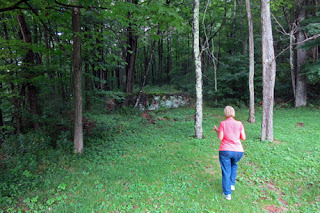 Rosecrans proposed having the young man guide a brigade through the woods to attack the farm. Names of soldiers lost at the Battle of Rich Mountain are carved into rocks. 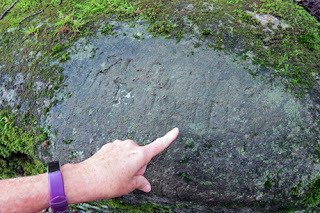 Bonnie points out the faint word "Killed" with one name. 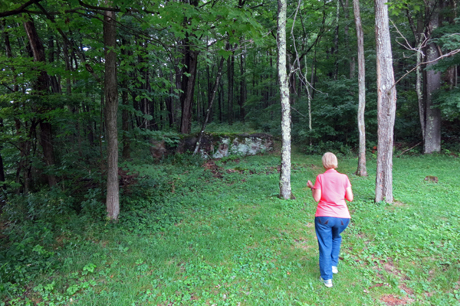 It was easier said than done, but Rosecrans' force managed to slash through the dense forest. In a sharp fight they captured the farm, forcing the Confederates to abandon their whole position on the road and take to the woods themselves in an effort to escape. Many were captured. McClellan never did make his own attack, but he got credit for the win. Euphoria over this relatively minor victory ignited an "On to Richmond" spirit in the North that encouraged the still unready Union army to go into the much more important First Battle of Bull Run — a massive and stunning defeat. Vandals have riddled sign at Rich Mountain Battlefield with bullet holes. It's a curious reminder of the grim history made here. In the wake of Bull Run, McClellan, still covered in the seeming glory of quick victory at Rich Mountain, succeeded to command of the Union army. His promotion would have further consequences. 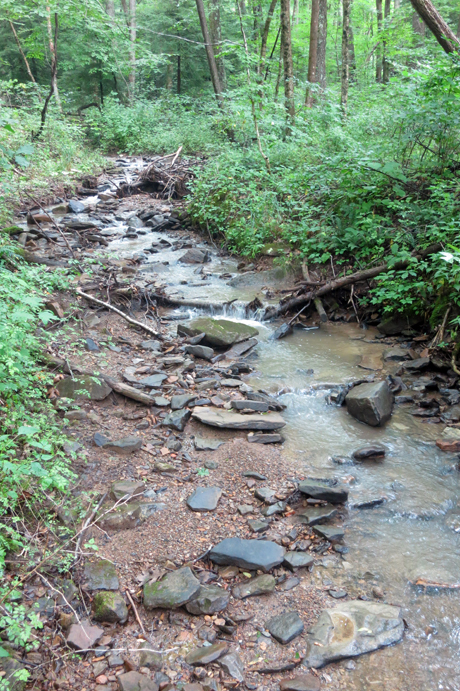 Overshadowed by the disasters that followed, the Union victory at Rich Mountain is forgotten today, as is the little road up the mountain that once served as a mighty turnpike connecting the Eastern United States to the Ohio River route to the West. For my purposes, "forgotten" is good. This is exactly the sort of road I would love to ride on my Royal Enfield. disturbs the silence of the battlefield today.